We are so fortunate to have literary experts within our group and those willing to reach out to us. Below are the slides from Dr. Kathleen Whitbread's presentation and an Anotated Bibliography, which could be hugely helpful when speaking to your districts about reading intervention. If you go to Dr. Whitbread's blog (link below) and hit the "follow" tab, every time she posts something you get an email. She has posted really great research on reading and children with DS and about some apps she finds useful and more. Her blog is http://openbooksopendoors.com/ I'm sure you've read about her project, but in case you haven't, I pasted the summary below. The Open Books Open Doors project is funded by grants from the Connecticut Down Syndrome Congress and the University of Saint Joseph, providing free literacy screenings for Connecticut children with Down syndrome in pre-school through grade 3 as well as resources for parents and teachers on best practices in literacy instruction for students with Down syndrome. When you visit the blog, it would be great to post a question or make a comment, as this demonstrates a need for future research and training! 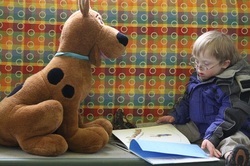 Another good literacy blog, although not dedicated specifically to children with significant disabilities, is Literacy Best Practices, which is run by our very own Sheryl Knapp. To reach the blog, go to: http://literacybestpractices.com/welcome/. Click on the "Literacy Learning Center" link on the right-hand menu to reach the online learning module -- the password is "fluency". There are a bunch of good articles referenced which you and your teachers might find helpful. Remember, ultimately, that reading practice of any kind will not build fluent readers unless the underlying phonetic knowledge is intact.